For those women who are experiencing difficulty concentrating as a result of menopause, this symptom can often be confusing, even unsettling. 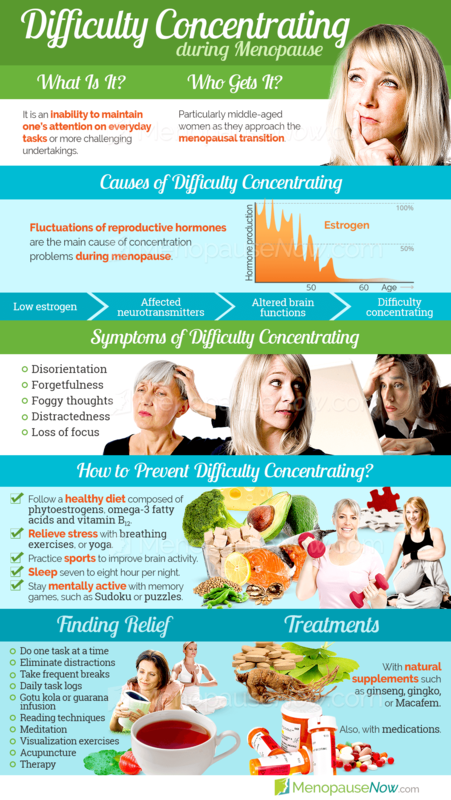 There is a variety of reasons why a woman may experience difficulty concentrating. For most women, however, it is typically due to hormone fluctuations that occur during menopause. Learn more about difficulty concentrating, its causes, and the treatment options in order to gain back control of one's own sense of focus. While difficulty concentrating is an incredibly common symptom, it can be subtle at times. For this reason, it is important to know the common characteristics of difficulty concentrating. Difficulty concentrating is defined as the inability to concentrate on everyday tasks or unusual or complex tasks. Along with this, women may experience disorientation, general forgetfulness, and lost trains of thought. This can be a cause for concern for many women who typically possess the ability to concentrate, and it may lead to problems in the workplace or in a woman's personal life. In addition, women may feel some concern that this is an early sign of more serious conditions such as Alzheimer's. To ease concerns about difficulty concentrating, it is beneficial to know what the exact characteristics are. The box on the right shows the most commonly experienced characteristics of difficulty concentrating. A menopausal woman may notice one or several of these signs to varying degrees of intensity. If a woman is experiencing these characteristics of difficulty concentrating, it is helpful to understand why they are occurring. Click on the following link for more information about difficulty concentrating, or continue reading to learn more about its specific causes. A focus disorder like ADD or ADHD is only diagnosed in cases when there is a lack of focus in several areas, including work, home, and social life. If you are experiencing a lack of focus in only one of these areas, you may be simply bored, not suffering from a disorder. There are a number of factors that can cause an inability to concentrate, including lack of sleep, menopause, and depression. In the workplace, difficulty concentrating can affect productivity, distance you socially and professionally from your colleagues, and may eventually put you at risk of losing your job. While a number of factors can trigger difficulty concentrating, hormone fluctuations are typically why this occurs during menopause. Estrogen in particular plays a key role in the numerous brain functions. 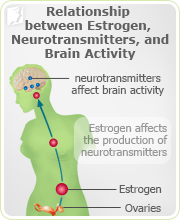 Estrogen has an effect on the production of all three of these neurotransmitters. When estrogen levels are adequate, production is more stable. In addition to the primary hormonal causes behind difficulty concentrating, many women may have concentration issues that stem from other menopause symptoms. Sleep disorders and fatigue can render a woman too exhausted to concentrate properly on daily tasks at hand. Psychological symptoms such as depression, anxiety, or panic disorders can also have a hand in difficulty concentrating. When a woman is under stress, she may not be able to focus to the best of her ability. Difficulty concentrating is mainly attributed to the fluctuations in estrogen that influence neurotransmitter levels in the brain. However, there are many contributing factors that can influence a woman's level of concentration. Fortunately, there are many different treatment options available for managing this symptom. Click on the following link to find more information about the causes of difficulty concentrating, or read on to learn more about ways to overcome difficulty concentrating to regain control. Anxiety is more than just a nervous feeling. In many people, heightened states of anxiety can affect them physically, leading even to panic attacks - which can include shortness of breath, dizziness, nausea, headache, and rapid heartbeat. Anxiety and panic are directly linked to difficulty concentrating. To treat this problematic symptom, a three-tiered approach can be utilized. It is recommended to start with the least invasive option, and then move towards more drastic measures if necessary. 1. Lifestyle changes. Some easy lifestyle tips can help sufferers cope with difficulty concentrating. A healthy diet rich in brain-friendly nutrients like omega-3 and omega-6 - found in fish and walnuts, for example - can help. Cutting back on caffeine, alcohol, and sugar can also help improve concentration. Getting better quality of sleep goes a long way as well. Stress-relieving techniques like meditation or yoga are also helpful in aiding a woman's ability to concentrate, and brain exercises such as crossword puzzles can improve overall focus. Intense aerobic exercise can increase brain volume in older adults. 2. Alternative medicine. If coping methods and simple lifestyle changes are not working and a woman is still experiencing difficulty concentrating, there are further treatment options available. Alternative medicines that address the hormonal imbalance at the source are the most effective treatment method, particularly in conjunction with lifestyle changes. 3. Medications. For more serious incidences of difficulty concentrating, increasingly drastic measures can be taken, but they should always be undertaken with the help of a medical professional. Women who wish to improve their concentration should begin with lifestyle changes, then move onto alternative medicines, and finally, consider medications if nothing else seems to work. Click on the following link to learn about specific treatments for difficulty concentrating in these three categories. Severe concentration problems can make daily tasks seem impossible as a mental fog clouds your better judgments and thinking. Continue reading for some tips on what you can do today to deal with your severe lack of concentration once and for all. 09/20/2017 Many people believe that ADHD is a condition that only affects children, but that is not the case. While the disorder begins in childhood - before age 12 - many people are never diagnosed and continue their lives not realizing they have ADHD. An ADHD diagnosis in an adult can help significantly improve concentration and mental functioning. 08/14/2017 The official diagnosis manual for psychologists in the United States - called the Diagnostic and Statistical Manual Fifth Edition, or DSM-5 - has combined ADD and ADHD into one single diagnosis, called ADHD. The separation in types of ADHD is meant to improve the efficacy of directed treatments for different types of concentration difficulties. 04/15/2016 Concentration is a vital function that's needed in many aspects of daily life, from the workplace to other activities, like driving or reading the newspaper. During menopause, hormonal imbalances affect the cognitive functions, which may result in difficulty concentrating. Keeping the brain stimulated, plus other simple lifestyle changes, could help combat concentration issues. 09/14/2011 It's happening more and more frequently. You're in the middle of a conversation, and suddenly, your train of thought is gone. Or maybe you just feel an inexplicable sensation of disorientation. If you're having difficulty concentrating, it may be more than just an inevitable sign of aging. Learn more here.